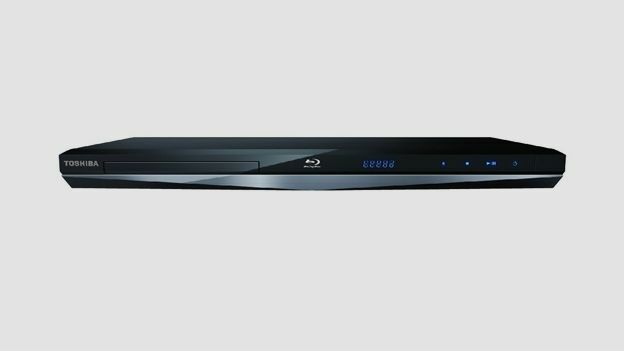 The Toshiba BDX5300 is a Wi-Fi enabled Blu-ray deck with a smattering of internet services that's available at a decent price, but is it any good? The Toshiba BDX5300 is 3D-compatible with Wi-Fi onboard and Smart functionality. It's the flagship in the brand's BD fleet, but the use of polish is miserly at best. Squarely aimed at the DVD upgrader, the BDX5300's disc-spinning rivals are the LG BDP420 and Sony BDP-S1100. This deck's headline attractions appear to hit all the hot buttons. If you can't use a wired Ethernet connection, Wi-Fi is resident which offers access to a quartet of connected services: BBC iPlayer, YouTube, Picasa and Acetrax. The player has both a local USB media reader and can unspool content from across a LAN. Toshiba keeps connectivity neat and tidy, with just HDMI, Ethernet and coaxial digital on the rear, while the front panel offers a USB input for media playback. Slim at just 35 mm tall, build quality is decidedly plasticky and doesn't inspire confidence. The deck is as light as a feather (when the box turned up we suspected it was empty! ), and the squat remote screams budget - the keys on the directional pad are squeezed very close together and have a squidgy unresponsive feel. There's some refinement though when it comes to design, soft touch controls on the deck itself are swish. The BDX5300 offers a stripped-back menu system that's far from fancy, but setup and navigation is at least straightforward. Opt for Wi-Fi and the player scans for available networks and then presents a software keyboard to enter the security details, select Media Server Search and you'll be presented with a list of network connected PCs and NAS devices. Unfortunately, disc loading times are a tad mediocre. The Java-heavy edition of the James Bond classic Goldfinger takes 63 seconds to get from tray in to menu, which is darn slow. A Java-lite concert disc loaded in 36 seconds, which is average. The deck's audio visual performance is solid enough, given the price point. Its hi-def images are crisp and clean, while multichannel audio is delivered both as PCM and bitstream depensding on your preference. There are basic video calibration controls which you almost certainly don't need to bother with. CD playback can charitably be described as functional. File playback support both across a LAN and from USB includes AVI, MOV, but not MKV. Audio format support embraces AAC/M4A and MP3, the latter playing back with album art when available. Squarely aimed at DVD upgraders, this hi-def lightweight betrays its OEM origins with a characteristically cornball Shenzen menu. But it's not without some charm: there are intensely lit soft touch controls on its super-slim fascia, integrated Wi-Fi for easy networking plus a sprinkling of online entertainment apps, in the shape of the BBC iPlayer, YouTube, Acetrax and Picasa. The deck offers a USB media reader and can play from NAS devices, but file support is basic. HD video quality is decent enough for the price. This anonymous player could be a smart buy if you buy it bundled with free Blu-ray movies. Not a star in its own right though.